Raymarine autopilot with hydraulic drive and internal gyro compass. The autopilot hydraulics were replaced in April 2016. The 12V Spectra Newport 400 Watermaker can generate up to 50 litres per hour. The membrane was replaced in 2015. 12V and 230V AC system in all three cabins plus main saloon and galley. 80 Amp battery charger for service batteries. 50 Amp battery charger for engine batteries. 100 Amp service alternator on main engine with TWC controller. 50 Amp starting battery alternator on main engine. 1 x Spinnaker made by Ullman (2003) - all ropes, pole and hardware included. Last anti-fouled in April 2016. The deck is formed using the same method and materials as the hull. When new the deck was painted with micro-balloon non-slip white paint. She has a hi-tensile stainless steel keel strut with a cast lead bulb. 1 x manually operated head. Variable speed fresh water pump system. Balck water holding tank capacity of 500 litres. Macerator pump and deck pump out. 1 x 55lb Spade anchor with 100m of 10mm calibrated anchor chain. 1 x 55lb Spade anchor with 15m chain and nylon rope. 2 x Primary 66.2 self-tailing electric winches. 2 x Secondary 53.2 self-tailing electric winches. 2 x Halyard 46.2 self-tailing electric winches. Raymarine GPS, chart plotter and radar with MARPA RL70C at the helm. Leica 420 GPS Navigation system. Oilskin hanging locker aft of the navigation station. The engine compartment has a mercury switch that when activated automatically switches on the bilge pump. McMurdo EPIRB 406MHz - Battery replacement date June 2017. This Valicelli 65 sloop rigged sailing yacht, designed by Andrea Valicelli and built to order by VR Yachts Italy in 2003, has remained under the same ownership since her launch. The boat has been well maintained and continuously updated. It provides a secure and comfortable cruising environment with the ability to perform long passages having large diesel tankage (800 litres),water tankage (800 litres) and an efficient water maker ( Spectra Newport) Lola K has been cruised out to Madeira in the west and to Greece and Turkey in the east, mainly with just the owner and wife as crew. 2. Engine (105 HP Volvo Penta) overhauled and a new turbocharger fitted. 6. New domestic batteries (7x110amp hours ) fitted and rewired. 9. Topsides and deck cleaned and polished April 2018. 10. Wash and overhaul main and genoa with new sacrificial strip to genoa leach. 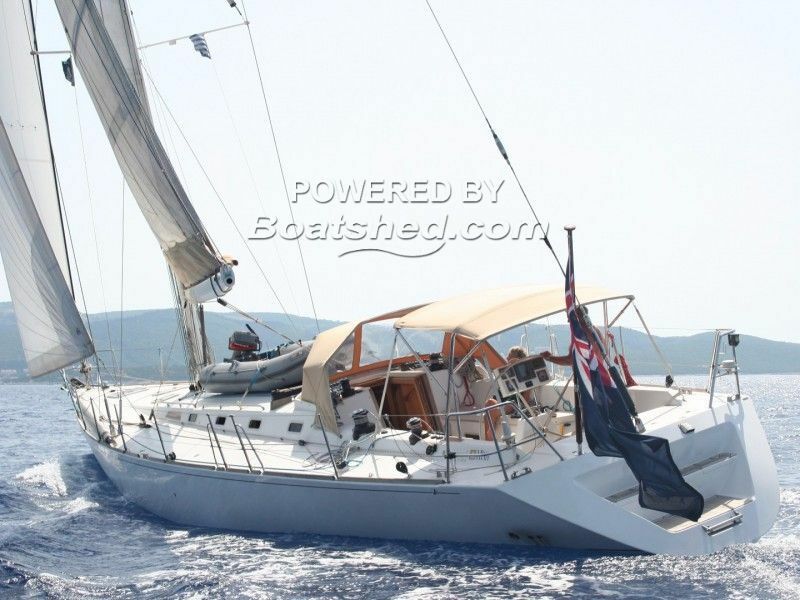 The owners of this lovely Valicelli 65 wanted the ability to cruise long distances short-handedly and as such, choose to design her so that all the sails are controlled from the cockpit (Hardware includes: 6 electric self-tailing winches and a hydraulic vang.) All of the running rigging is lead back to the cockpit to ensure ease of sail control. In fact, she has been sailed many times single handedly, demonstrating just how easy she is to manage. Her cruising speeds under sail are impressive too, with the owners logging up to 16 knots and she’ll happily cruise under motor at around 10. The cockpit is spacious and provides a clear, safe area from which to control the yacht. Several Raymarine multi- displays, a chart plotter and auto-pilot controls have been installed at the helm. There’s also a removable table that can be quickly assembled to create an alfresco dining space. With three cabins and three heads on board, there’s sleeping accommodation for six guests. The master cabin and starboard side twin, both have en-suite heads with showers. The port side cabin has an interconnecting door to the day head. The most forward cabin (accessible via a hatch on deck) is currently being used as a sail and rope locker, but does have two cot berths for crew. The interior has been finished in European oak with teak and holly sole boards; giving a light and spacious feel. The Nav Station has a full sized chart table; navigation instruments and safety equipment. There’s also an oilskin hanging locker aft of the seat. The master cabin has a double bed with a 'Vi Spring' spring mattress, en-suite heads with shower, dressing table with mirror and ample storage. The saloon upholstery is in beige alcantara fabric, known for its resistance to salt air and sea water. The u-shaped settee and fixed dining table would comfortably seat 8. The port side saloon settee is long and wide enough to use as a berth too. All berths are fitted with lee cloths. The galley is equipped with a Force 10 cooker with four burner hob; a top loading freezer and a front loading fridge. The engine, located underneath the companion way steps, is easily accessible and has been serviced yearly between 160-180 hours of use. She’s had one owner since new, been well looked after and would be great for family cruising or, as charter boat. This Vallicelli VR 65 Keenly For Sale has been personally photographed and viewed by Edward Kay of Boatshed Riviera. Click here for contact details. Please note this comments section is public. Please do not post your personal details here. To enquire about purchasing this boat, please contact the broker directly at edwardkay@boatshedriviera.com. Please read our commenting guidelines before posting.